Can the Growth Plan’s Major Transit Station Area (MTSA) policy be the beachhead into the Yellowbelt? On May 24, I took part in a panel discussion on the five recommendations from the Toronto Region Board of Trade's housing policy playbook on how to address housing affordability in the Toronto region. The other panel members were Jay Pitter, Allan Weinbaum, and David Wilkes. Tim Hudak moderated a lively discussion. The Board's recommendations are aimed at increasing housing supply by adding the right type of housing close to transit. My contribution to the panel discussion was to highlight the provincial policy that requires municipalities to do just that. Policy 2.2.4 of Growth Plan for the Greater Golden Horseshoe requires municipalities to delineate boundaries for Major Transit Station Areas (MTSAs) using a 500-metre or a 10-minute walking radius around existing or planned higher-order transit, including all subway, GO Regional Express Rail, LRT, and BRT stations. Within these areas, new density targets will apply. In other words, we have planning tools in place to unlock supply and diversify our housing stock in transit-accessible locations, just as the Toronto Region Board of Trade recommends. There is just one problem, as I pointed out. In Toronto, all these Major Transit Station Areas (MTSAs) overlap with the City's "Yellowbelt," a term coined by urban planner Gil Meslin to describe established residential neighbourhoods that are zoned for detached or semi-detached housing only (shown as yellow on the the City of Toronto's official plan map). Neighbourhood policies and zoning prevent these neighbourhoods from changing to meet housing demand and exclude them as a source of new housing supply. The Yellowbelt includes about 60% of all residential parcels in the City of Toronto. The Growth Plan's MTSA policy provides a framework in which the City could begin to address the vexing question of how change can be introduced to these neighbourhoods through moderate changes in density, what planners call the "missing middle" types of housing." The City already has an Avenues policy that encourages mid-rise developments along designated arterial roads; however, because 60% of all residential parcels are within the Yellowbelt, additional policies are required to spread growth across the City. Our research team did a quick calculation of MTSAs in the City and found more than 24,000 residential parcels zoned for residential detached or semi-detached houses only. As with laneway housing, redevelopment of these parcels, for example, by replacing single-family homes with duplexes and triplexes, would add much-needed housing supply in communities with transit access, infrastructure, and amenities. With more than 240,000 parcels zoned for single-detached or semi-detached houses across the city, the Yellowbelt must be considered in any discussion of land supply. By comparison, in Chicago, the city in which I was born and raised, only 37% of residential parcels are zoned for single-family houses. Duplexes, triplexes, and mid-rises make up a significant portion of the housing stock there. They can be found in both prewar and postwar neighbourhoods. I join with Gil Meslin, Sean Galbraith, Cheryll Case, and Paul Smetanin, all of whom have called for a rethink of the City's "stable neighbourhood" policy and zoning that protects the Yellowbelt. The Toronto region is undergoing a transition in its model of growth because it must do so. As urban theorists like Richard Florida have noted, once a city-region reaches 5 million people, it can no longer grow outward, it must grow differently. Well, guess what? The Greater Toronto Area reached 5 million people in 2001. It is no coincidence that in the following year, the provincial government under Premier Mike Harris set up the Smart Growth Panel, chaired by former Mississauga mayor, Hazel McCallion, to provide the government with advice on how best to manage and coordinate growth in the region. Many people forget that it was a Conservative government that laid the groundwork for today's Growth Plan for the Greater Golden Horseshoe. So now we have a regional growth plan in place that contains polices and direction for municipalities to grow more compactly and meet density and intensification targets. One major problem is that since 2001, our housing market has bifurcated into two extremes: single detached houses at one end of the market and ever-smaller high-rise condominiums at the other. Everything in between - mid-rise apartments and the ground-related, missing-middle types such as duplexes and triplexes - are growing slowly, if at all, as a proportion of the housing stock. Our research shows that in 2001, these types represented about 27% of the GTHA's housing stock and by 2016, they had inched up to represent about 30%. A closer look at mapping from the Neptis report Growing Pains shows the effects of this bifurcated housing market - the loss of population in "established neighbourhoods" juxtaposed against an explosion of growth at the urban edge and the "manhattanization" of certain areas such as downtown Toronto, central North York, and Mississauga City Centre. 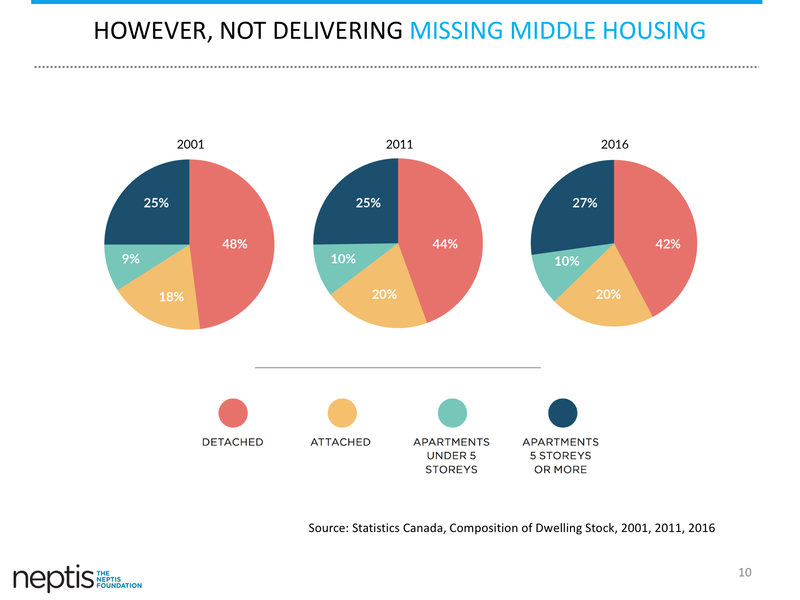 These patterns highlight the need to diversify the housing supply and strategically direct more missing middle types and mid-rises to transit-accessible locations across the region. The Growth Plan offers a framework for change and the Growth Plan's Major Transit Station Area (MTSA) policy can serve as the beachhead into the Yellowbelt. The City of Toronto and other municipalities across the region will soon be delineating the boundaries of the Major Transit Station Areas. The policy requires municipalities to plan these areas for a specified minimum density. This does not mean that every Major Transit Station Area will see the same amount or density of growth, because there are exemptions built into the policy and allowances for some MTSAs to have more and others less. What should happen, however, is a long-overdue discussion on how we can begin to build more housing near transit in the Yellowbelt.